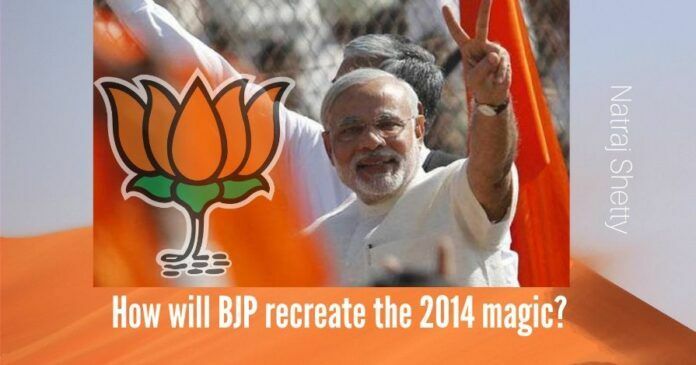 Home Opinion How will BJP recreate the 2014 magic? How will BJP recreate the 2014 magic? It is time to respect core supporters of the party and voters and honor commitments made to them. No one wants the Congress, Commies mix of dis-oriented opposition in power, at any cost. This is a word of caution to few who have started to abuse, malign, threaten, blackmail, and apply force in case someone talks against the Govt policies, method and so on. If 2019 has to be won by BJP, we have to take along all those who voted in 2014. You can’t ignore the core support base. There are many who have a valid reason for being disappointed with the present government on many fronts. It is not a wise strategy to be deaf to their concerns. We just can’t start pushing them away. 2014 was won with 33 % vote share for BJP and to repeat and better that performance requires all-around support. It is important that BJP wins 2019. We live in a democracy and seek votes with folded hands, not with a sword in hand. It is time to respect core supporters of the party and voters and honor commitments made to them. For the failed promises, go to the people and tell them about the inability to fulfill those. It is very important that the ideology of Hindutva should be honored. What I see nowadays is arrogance, an attitude of confrontation, disregard for the core support base, picking up fights with all and sundry. Remember that this will not take you very far. Introspect please and make the course correction. The people want BJP to win in 2019. It is important that BJP wins 2019. It does not matter who leads the party, the momentum should continue. It is very important that the ideology of Hindutva should be honored. Corrupt crooks and criminals should be ousted and punished. No one wants the Congress, Commies mix of dis-oriented opposition in power, at any cost. Next articleConversation with Prof RV on Sabarimala – Is Courts’ Credibility declining? DO NOT VOTE FOR FACIST /HINDUTUVA party. All facist should be ousted out of the country. India is for Indians not for hindurastra/hindutuva/facist. There is a huge task in front India as India needs a Congress, Naxal, UrbanNaxal, Leftist, Communist, Breaking India forces mukt Bharat… henceforth, in 2019 and beyond. Our PM claims he is a fakir which he appears to be. But why he fears for Congis first family? Is there any international pressure from places like Russia still influencing? Well said. I still believe we can make it. India will become a hindu rashtra. Just have to get that magic ratio 3/4th majority. Correct. But one small change, BJP was not arrogant with a small group of supporters. That group was only arrogant and scolded the Prime Minister in every forum. Unity is strength. For saving Dharma, the small group should co-operate and help in re-enacting 2014 again in 2019.. for the sake of continuity of Dharma, for the sake of Hinduism.